Features: Extremely RARE... Impossible to find! Only 30 Produced in Platinum! 125th Anniversary INVESTMENT COLLECTIBLE! Bvlgari Platinum Sotirio Tourbillon Perpetual Calendar SB43BPLTBPC! INVESTMENT COLLECTIBLE 125th Anniversary!!! BVLGARI's NEW SOTIRIO BULGARI COLLECTION is a Tribute to the 125th anniversary of Bulgari and its founder Sotirio Bulgari! Bvlgari produced many hundreds of 18k Gold either in Rose or White... ONLY 30 were produced in Platinum! This is the last NIB of the ONLY 30 Platinum examples produced! It's now an incredibly RARE collectible! 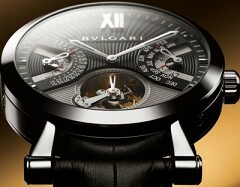 Driven by his entrepreneurial spirit, Sotirio Bulgari was capable of overcoming challenges and conventions, continuously redefining the concepts of 'avant-garde' & luxury On the 125th anniversary of its foundation, Bulgari dedicates a watch to this multicultural trailblazer, businessman and aesthete: a watch as extraordinary as him. The new Sotirio Bulgari features a classic style reinterpreted in a contemporary way. Bulgari was able to recognize the fruits of its vertical integration in the watchmaking sector: having entirely designed, produced and assembled a caliber for the first time in its history. The Group went on to launch the Sotirio Bulgari Tourbillon Quantième Perpétuel in 2009, the first watch with the movement and all components completely produced and assembled in-house. Fully developed by Bulgari, the BVL 465 Caliber comprises an automatic see-through tourbillon and perpetual calendar with an innovative display that features double coaxial retrograde hands, 46 jewel automatic Bvlgari movement, 30 meters water-resistant too. A perfect synthesis of innovative design and manufacturing 'savoir-faire'; it is distinguished by its sophisticated workmanship and great attention to every detail. The new collection dedicated to this man is Bulgari's new version of a formal watch, featuring manufacture movements, dials finished with exclusive treatments and a unique design for the case, whose bezel is distinguished by the absence of the Bulgari logo. An expression of Swiss watch making art the Sotirio Bulgari Tourbillon & Perpetual Calendar watch is characterised by it's exclusive functions and high quality craftsmanship. The Sotirio Bulgari Tourbillon Perpetual is the most evident example of this achievement; fully developed by Bulgari, the BVL 465 Caliber represents a unique fusion of functions: an automatic see-through tourbillon and perpetual calendar with an innovative display that features double coaxial retrograde hands. Platinum Tourbillon Perpetual Calendar watch, limited in Platinum...number 15 of only 30 pieces, large round platinum case that is 53mm with lugs by 43mm, display reverse, black alligator leather strap with platinum tang buckle, black guilloche dial, silver hands and hour markers. Tourbillon, retrograde coaxial perpetual calendar, 46 jewel Caliber BVL 465 self-winding mechanical tourbillon movement, 64 hour power reserve, the sapphire crystal & reverse display allows a see-through of the complete tourbillon, 30 meters water-resistant too. This Sotirio Bulgari Tourbillon Perpetual Calendar is equipped with the highly sophisticated BVL 465 caliber movement: an automatic tourbillon featuring a perpetual calendar with double coaxial retrograde hands. The perpetual calendar automatically adjusts the date to the length of the current month & adjusts for leap years as displayed through an original double coaxial retrograde hands system. The displayed tourbillon device limits the influence of gravity on the precision of the watch. 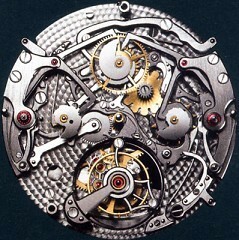 The subsidiary second hand is mounted on the Tourbillion cage. It has Bvlgari manufactured multi-level dial with "guilloch?" treatments, hand-applied Roman numerals, faceted indexes and counters. The 43 mm in-house manufactured platinum case has a monogrammed crown, an anti-reflective convex sapphire crystal plus the display case back. 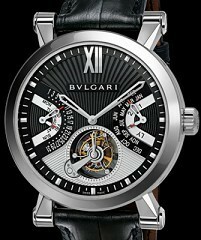 The BVL 465 caliber movement is an exclusive multicomplication by Bvlgari! The design & development of this new Bulgari caliber took 5 years and required the contribution of 14 different specializations. Its production calls for the highest level of craftsmanship and precision from the Master Watchmakers who work for 3 months to execute the 8,370 delicate operations that go into the manufacturing, assembly, finishing, setting and control of the 465 components of this caliber. Bulgari's meticulous attention to detail is exemplified in the range of refined finishings given to each of the components & the 18k gold rotor. Available in platinum with a limited & numbered edition of only 30 pieces worldwide. This is one of the 30 ever produced with a list price of $258,000! In addition to the limited edition of only 30 pieces in Platinum, Bvlgari also produced this incredible wristwatch in Rose Gold limited to 250 pieces, retail was $213,000, & White gold limited to 125 pieces worldwide! In Demo NIB condition...both large inner & outer Bvlgari boxes, outer shipping box, polishing cloth, Bvlgari Book & Cerificato of Autenticita, Bvlgari International Warranty imprinted by USA dealer, no date & still open, has the large Black Bvlgari shopping bag too. Retail increased slightly on internet, retail would be higher today! Sell for $183,750!